Whatever happened to Breezes Mobay? Well, after over 14 years of operation, Breezes Montego Bay closed its doors on September 30, 2009. It was in the early nineties that visionary hotelier, founder and chairman of SuperClubs John Issa embarked on making his dream of providing a chain of hotels that offers high quality all inclusive service at an affordable price a reality. This dream was realized with the construction of two hotels under the Breezes Brand, Breezes Montego Bay being one of them. The property had a few things going for it, one being the location, and the other, its amenities. Its location could not have been more perfect. Right in the middle of Montego Bay’s most pulsating tourist area the “Hip Strip”, which is the entire Gloucester avenue. And guess who it's neighbor was? The world famous Doctor’s Cave Beach! Breezes Montego Bay had an interrupted view of the breathtaking Montego Bay sunset, which is worth writing home about. The hotel was a mere 10 minutes walk to Montego Bay’s only international airport on one side and pretty much the same amount of walk time on the other side, to the city’s center Sam Sharpe Square. I guess for these very reasons SuperClubs could not resist planting their flag there. Breezes Montego Bay Jamaica had welcomed its first guest on September 02, 1995. However with all of the superb service , fun activities and perfect location that the property provided, the always improving Breezes Brand was outgrowing the Montego Bay Property. I have always wondered how they manage to cram all they had into that small property. According to Mr. John Issa, “after extensive market research, the decision was taken to re-position the Breezes Brand”. A November 1st deadline was given for the beginning of the re-positioning exercise. For Breezes Montego Bay the deadline would be a little earlier as the lease on the property was coming to an end in October. And so on September 30, 2009, Breezes Montego Bay closed its doors. Of course, this also meant no more Friday night hanging out with friends at the properties popular Hurricane Disco. A number of staff members were given the opportunity to fill vacancies at other Breezes/SuperClubs properties while the rest were given redundancy packages and wished all the best. Return to All Inclusive Jamaican Hotels from Breezes Montego Bay Jamaica. 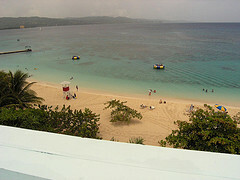 Return to HomePage from Breezes Montego Bay Jamaica.